Maker! is the map production portion of GeoCommons and Finder! is the search engine for geospatial data. Together they allow users to create web maps that can be shared with the world. So to get information in Maker!, you first upload your data to Finder! and then add it to your map. The byproduct of this workflow is more data gets added to Finder! and in turn more data is available to the community at large. Freely sharing data is one the core components of GeoCommons (compared to WeoGeo which is more of a marketplace). Stefan Geens does a good job of showing how the map is created and how you set what we usually refer to the symbology of layers. What I like about this approach is you can bring to light the data in ways that before Maker!, required custom programming to achieve good looking results (if even possible). FortiusOne, according to Sean, worked with cartographic professionals to create the rich (I’m sorry) map production tools. These tools are so good in fact that I’ve heard a couple GIS professionals lament that they’ll be out of a job soon (of course we all know that Maker! will only increase our workloads to produce data for public consumption). What we have here are two really simple tools that allow anyone to upload geospatial content, combine that information with other datasets and then create a wonderful looking map that visually tells a story. You can argue all day and night about what the GeoWeb is or isn’t, but I think we have an excellent example of what the GeoWeb should be right here. Finder! has discoverable web services of data (with metadata to boot) and Maker! allows you to leverage those services together to create derivative value content to share with the world. Moving forward, the data of GeoCommons should support more OGC services (beyond KML) for those who need that support and the maps created with Maker! should be more easily shared beyond just an web map. But the groundwork is there for sharing data with the world. 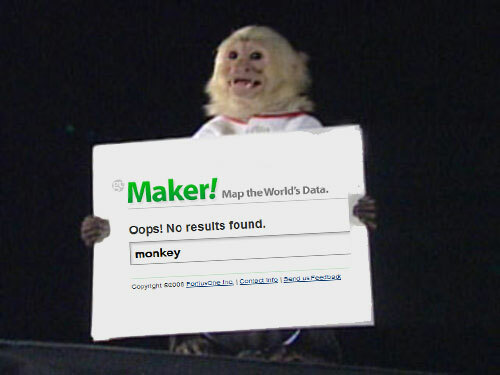 Despite the lack of monkey maps, the GeoMonkey approves of Maker!